Los Angeles, CA - Join the Mane 6 and friends for a quest of epic proportions! My Little Pony - Friendship Is Magic: Cutie Mark Quests is coming to DVD on June 30 in the U.S. and Canada from Shout! Kids in collaboration with Hasbro Studios. In Equestria, being true to yourself is the key to earning your cutie mark. Join Twilight Sparkle, Apple Jack, Pinkie Pie, Rarity, Fluttershy and Rainbow Dash--as well as everyone's favorite Cutie Mark Crusaders, Scootaloo, Sweetie Belle, and Apple Bloom--as they journey to find their own Cutie Marks, take on the spirit of chaos and disharmony and visit a village where... everypony has given up their Cutie Marks?! It's all here in Cutie Mark Quests! 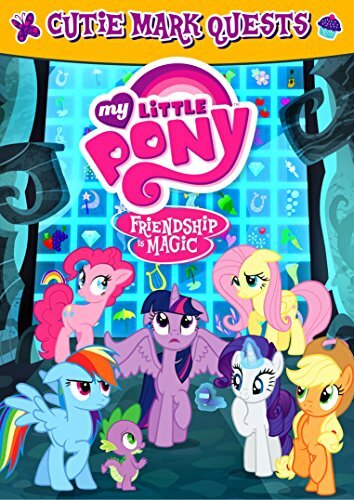 My Little Pony - Friendship Is Magic: Cutie Mark Quests carries a suggested list price of $14.98 and is now available for pre-order at amazon.com, amazon.ca, and shoutkids.com. Hasbro Studios is responsible for entertainment brand-driven storytelling for Hasbro across television film, commercial productions and short-form content. It develops, produces and distributes TV shows based on Hasbro's world class brands, including TRANSFORMERS, MY LITTLE PONY, LITTLEST PET SHOP and FAMILY GAME NIGHT. Many of these shows air on Discovery Family Channel and on networks in more than 180 territories globally. Since its formation in 2009, the studio has received nine Daytime Emmy wins. On the film side, the studio has developed and produced a number of features based on Hasbro's brands. In addition to partnering with leading studios, the Company intends to make movies based on new and existing Hasbro brands for audiences globally through the Allspark Pictures film label. Films in development or planned for release, include CANDY LAND (Sony), G.I. JOE 3 (Paramount), JEM AND THE HOLOGRAMS (Universal & Allspark Pictures), MAGIC: THE GATHERING (21st Century Fox) and an animated feature based on MY LITTLE PONY (Allspark Pictures).